Bristol Rovers v Millwall FC. Sky Bet EFL League One fixture on Sunday 30th April 2017 at 12 midday. Millwall FC are to visit Bristol’s Memorial Stadium. 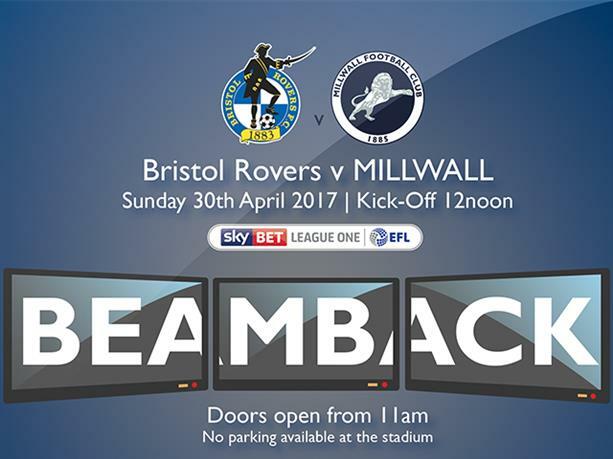 Nearly 1,300 Lions supporters have tickets for the final day clash at the home of Bristol Rovers. Other London-based football supporters can go along to The Den for a Beamback. It costs £10 for adults and is £5 for juniors. Doors will open at 11 am, with a choice of a sausage or bacon baguette on offer. There is no parking available at the stadium on the day. Tickets are off sale at 5 pm on Friday 28th April 2017. No Beamback tickets sold on the day.